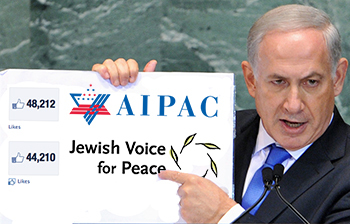 Help JVP beat AIPAC’s Facebook ‘Likes’ by Friday, and a donor will match $1 per Like! JVP or AIPAC: Who do you like more? AIPAC, the political powerhouse that ensures unconditional U.S. support for Israel’s most egregious policies, has suffered a string of embarrassing defeats: Visa waivers. Syria. Iran. With a few simple clicks, you can help us add one more to the list: Facebook. Last week we launched a campaign to surpass AIPAC’s Facebook follower count, and today we’re fewer than 4,000 “Likes” away from our goal of 48,000. We also just got word from a generous donor who will contribute one dollar for every new Facebook “Like”, through Friday! Click here to help us meet our goal of 4,000 “Likes”—and to help us raise $4,000. Already “Like” our page? We still need your help. To beat AIPAC— an organization with a $60 million annual budget— we’re going to need you to spread the word by taking this simple action. Although we’ve had fun with it, this campaign is no laughing matter. A bigger social network means our pro-justice, pro-peace perspective spreads even further. Plus, funds we receive from this campaign will help us to confront AIPAC on its own turf. Click here to ensure AIPAC loses this round, and that JVP has the resources we need to make AIPAC lose even bigger in the future. JVP has a relatively small budget, but we have more social media followers than organizations with budgets that are 10 and 50 times our size. 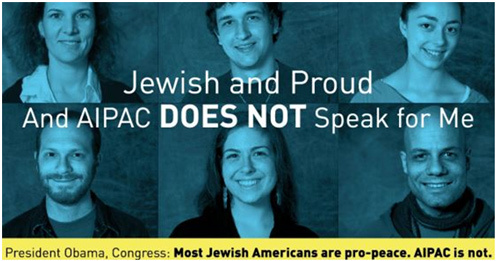 Defeating AIPAC on Facebook shows the size of the pro-justice constituency, compared to AIPAC’s shrinking pro-war base. We’ve got a way to go before defeating AIPAC online translates into the ability to defeat them in Washington. But with your help, we are getting there. Isn’t AIPAC Funded by US Zionist Christians in Texas and the Bible Belt?